Jaguar has been undergoing something of a resurgence over recent years. First came the superb XF, then there was the E-type inspired (and just as beautiful) F-type coupe. Next we got the BMW-beating XE and soon we’ll have the F-Pace SUV – surely one of next year’s most anticipated cars. At last, Britain is building cars that can compete with their German rivals again. And that sense of history is crucial. Throughout the Big Cat’s revival, its heritage has been at the centre of almost everything it does – informing design, guiding product development, calling out to the customer. Jaguar has even created a new heritage parts business, built a few lightweight E-types and set up a heritage experience centre. Gone are the bad old days of Ford ownership and a Mondeo dressed up in a posh frock to give us the X-type - this is the Jaguar of old, built on the cornerstones of grace, space and pace. Which got us thinking. With so much interest in the marque again, it won’t be long before prices of its slightly less modern vehicles start to appreciate. We’re not talking about the E-type or the Mk2, of course – these are established classics through and through with a loyal fan base, parts supply and club support. We’re talking about the cars that followed, and that sit between classic and modern. Cars like the XJ-S.
Born into the oil crisis era of the mid-1970s, the XJ-S is one of the marque’s more troubled motors. It was Jaguar’s answer to the question - ‘how do you replace the E-type?’ Reception in 1975 suggested it wasn’t the right answer. Critics were lukewarm to say the least. The car’s styling (especially those rear buttresses) caused onlookers to wonder where the feline, feminine curves had gone. But the XJ-S was a competent grand tourer. It was more aerodynamic than its predecessor too. And, despite what the naysayers would have you believe, people bought it. Don’t believe us? Jaguar made 72,233 E-types. But they made 115,413 XJ-Ss. So, as the XJ-S celebrates its 40th birthday, we began to look through the classifieds to see what a decent example of this car costs. Prices vary. We saw a 1990 V12 convertible with 30k on the clock for £10,950, while a dry-stored 1988 3.6 that needed recomissioning was just £1500. So five grand should get you something pretty tidy, with good history that’s been well looked after. Something that you can buy, use, enjoy and not lose money on when the time comes to sell. 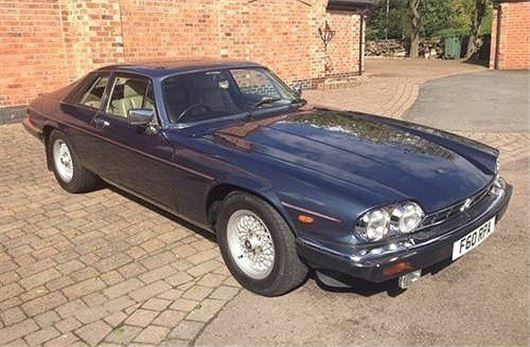 The listing that caught our eye was for a 1989 Jaguar XJ-S V12 Coupe, for sale at £4995. Finished in metallic Solent Blue with beige leather it certainly looks the part. The odometer shows 77,000 miles, which the vendor says is genuine and he has all the old MoTs certificates to verify this. He also has a full service history with the car, including all documentation and manuals – usually a good sign that a vehicle has been cherished and well looked after. The advert says the car has been freshly serviced, which you’d expect – but that’s no mean feat in an XJ-S as the rearmost pair of sparkplugs are very hard to reach. You want to make sure that these have been changed, as well as the oil. Regular 3000-mile changes will help this big unstressed engine solider on for years. The car has new Pirelli tyres all round, which will make it hard to check for another common fault – suspension wear. So, if you can, call up a local garage and see if they can get the car on the ramp (also a great time to have a proper check for rust). The underside of the car has been protected with Waxoyl, but any potential buyer will need to satisfy that the XJ-S’s main enemy – rust – has been kept at bay in every nook and cranny. According to the seller, the electrics are in good working order with a new battery fitted, there's a working CD player with an electric aerial, heated seats plus the air-conditioning has just been serviced and the headlining replaced. Coming with an MoT until August 2016, this XJ-S sounds like it could comfortably fulfil its intended purpose as a grand tourer, offering any potential buyer a touch of classic status with enough mod cons to feel comfortable at the wheel.